The Last Boston 'Snow Farm' Finally Melts : The Two-Way The city dumped cleared snow in unused parking lots this winter, creating piles it called "snow farms." This one was once 75 feet high. It finally became a puddle Tuesday. This was what the snow pile looked like at the end of May, before the summer sun began to melt it. If you bet that Boston's last bit of snow would melt July 14, you'd be right. You may remember that the city got a lot of it this winter, and it dumped much of the cleared snow in unused parking lots — which it called "snow farms." The last one to melt, in Boston's Seaport District, was once 75 feet high. As member station WBUR reports, "Mayor Marty Walsh tweeted Tuesday that a giant snow pile in a Seaport District parking lot, where the city dumped some of the winter's record-breaking snowfall after moving it off city streets, had finally melted." 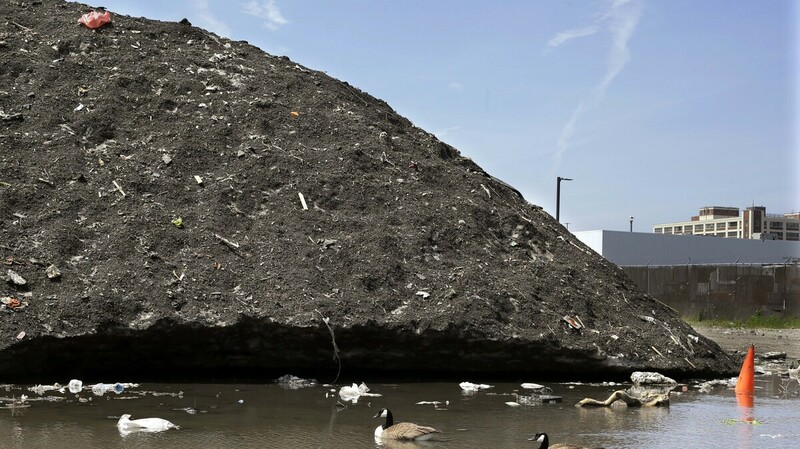 Walsh had challenged people to guess when the giant snow pile would disappear. The Associated Press notes that the last major blizzard was five months ago. "McEvers: And you have actually picked your way around this snow mound. I mean, what's in there? What've you seen? "Dennehy: Oh, so there's a lot of assets the Boston Water and Sewer Commission will be looking for us to return to them. There were some storm drain covers, catch basin covers, more than a handful of fire hydrants and other assets that other city departments are probably looking for. "McEvers: (Laughter) What? We'd also read that it was, you know, a lot of garbage. Is that true too? "Dennehy: Yes. So if you can imagine downtown Boston and the surrounding neighborhoods of Boston, during these four snowstorms, people were putting trash out as if it were going to be collected in a timely fashion. And it was collected, but unfortunately, it was collected by a front-end loader that was removing snow, so ..."